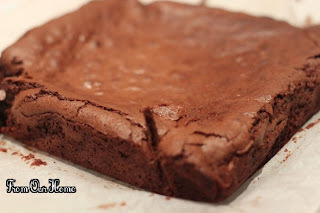 This recipe is a combination of several choc recipes that I have. It came about because I had some ingredients for one recipe and some for another, so I decided to put the two together. It's an easy one-bowl recipe. Pre-heat oven to 160C-180C temperature. Line a 8 inch square pan with baking paper. Melt the chocolate and butter together in a medium sized saucepan on low heat. Stir the melted chocolate and butter to get a smooth, shiny texture. Set aside for 5 mins to cool. Add in the caster sugar, mix well. Follow with the 2 eggs, again stir the mixture properly to ensure eggs are well combined. Slowly sift in self raising flour and fold into the mixture. Add in the espresso coffee. After that, slowly fold in the hazelnut meal. Pour the ready mixture into the baking pan and put into the pre-heated oven. Bake for 25 minutes. Test with a skewer or toothpick into the centre until it comes out clean. Cool in pan for 10 minutes. Then remove from pan and slice, dusting with some icing sugar before serving. Great idea combining the two! I like one bowl desserts, less washing up.